Xenoblade Chronicles 2 Rare Blades are an important part of the game. They give you different kinds of Rare Blade perks, called Blade Arts. You also give various bonuses and boosts through Field Skills and Battle Skills. To get Rare Blades in Xenoblade Chronicles 2, you need to collect Core Crystals. Our guide on Rare Blades in Xenoblade Chronicles 2 will break down how to get them and Core Crystals, how perks work, swapping Rare Blades among characters, and more. How to get Rare & Legendary Blades in Xenoblade Chronicles 2? To get Xenoblade Chronicles 2 Rare Blades, you have to bond with Core Crystals. There are several different types of Core Crystals: Common, Rare, and Legendary. Once you have them, you can then bond one of them to your character of choice. It appears that which Blade you get is a bit random. You usually get Rare Blades with Rare Core Crystals, but sometimes, you’ll get a Common Blade. Then again, sometimes a Rare Blade will pop out of a Common Core Crystal. You can expect to get your first Rare Blade about 15 or so hours in. As for Legendary Blades, you’ll normally get them by progressing through the story of the game. You might come across side quests that reward you with a Legendary Blade, though. 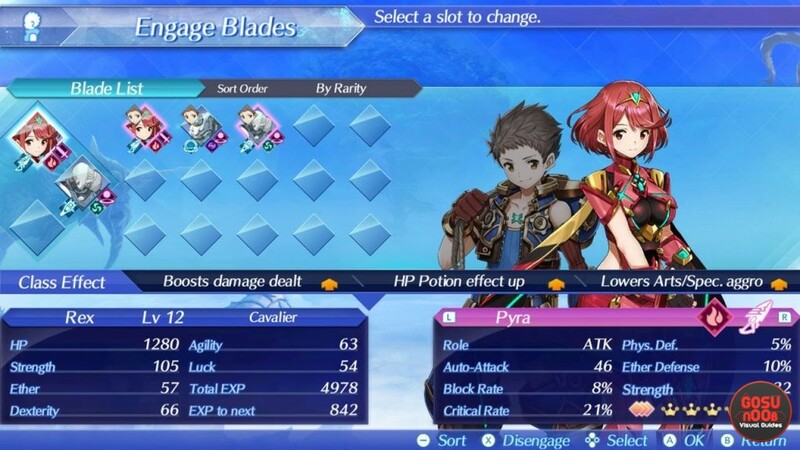 For more detailed info, check out our Xenoblade Chronicles 2 How to Get New Blades – Bond Blade Guide. How to Obtain Rare & Legendary Core Crystals? You obtain Legendary & Rare Core Crystals in Xenoblade Chronicles 2 as rewards for various activities. For example, you can get them as a reward for completing various quests. They can also drop from enemies, or you can find them in chests. Since drops in Xenoblade Chronicles 2 can get a bit chaotic sometimes, keep your eyes peeled for those Core Crystals. Different Blades can give your characters different perks, which are called Blade Arts. Let’s take Pyra as an example. She gives a boost to your accuracy and also increases you next Driver Art’s power. That’s not the only thing Blades can give you. Every single one of them offers different Field Skills and Battle Skills. You can also equip your Blades with Aux Cores to further boost them. As we’ve noted before, every blade gives you different kinds of bonuses and boosts. Among other things, they offer various Field Skills. These can give you different element mastery, focuses, and skills that will help you when you’re out and about, such as Lockpicking, Botany, Ichthyology, and the like. In the list below, we’ll show you what the game’s Main Blades will give you. How to Swap Rare Blades Between Characters? The first step to changing Rare Blades among your drivers is to go into the Manage Blades menu. From there, you can select Use Overdrive. This will allow you to take your Rare Blades and bond them to a different driver. That way, you can grant characters different perks, depending on what you need at the time. Xenoblade Chronicles 2 – How Many Rare Blades? There are almost forty rare blades in the game, and most of them are obtained through random bonding. Luckily, some of them are quest rewards you’ll get either during the main story, or by completing side missions. Our list is divided by role – attack, tank and healer. To get the Lucky Core Crystal you’ll need to buy the Greedy Monster Item from the Informant in Alba Cavanich – Empire of Mor Ardain. Now you can spawn a rare monster Gluttonous Marrin from the salvage point near Chansagh Wastes, Empire of Mor Ardain – Lower Level. This creature drops the crystal upon defeat. Kassandra is actually found in an Unlucky Core from killing a unique monster in Mor Ardain. You find the location of the monster by talking to the informant in Alba Cavinac.